Samsung's assault on the camera market concludes with the ST5500 and ST5000 range. Sporting the biggest OLED screen ever seen on a camera – a humongous 3.7 inches (ST5500 only) – Samsung has gone for both style and flashy functionality with these compacts. As soon as you pick up the ST5500, there's no denying just how slim and light it is. There's a nice feel to the camera as well which comes from Samsung using a technique known as hydro-forming to create its cameras. While it uses this in its TV range, the process allows Samsung to injection-mould the chassis creating an awesome design. Also on board is a lens boasting a design inspired by the mirror-writings of Leonardo da Vinci – bizarre but it means that you don't see the number info of the lens until you turn the camera on. Alongside some nice ergonomic touches – including a 7-degree slant on the bottom to help with self-shots and a slanted button for ease of use – the best thing about the ST5500 is the OLED screen. You just want to gaze into the brightness of it for hours on end – it's that good. And things improve when you touch it. A swipe here deletes a photo a title there lets you scroll through pictures. The ST5500 packs a 14.2-megapixel sensor and 7x optical zoom and also shoots 720p. 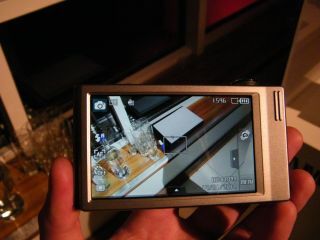 The ST5000 hasn't got the OLED screen (it has a 3.5-inch LCD) but keeps the same imaging functionality. Couple this with Wi-Fi and Bluetooth connectivity and what you have is a fantastic pair of snappers. Consider us ultra-impressed with Samsung's big-screen camera range. It's great to see a compact camera that looks good and also packs in the functionality. It's like Megan Fox with the brains of Carol Vorderman.